Al Hoffman and Jerry Livingston, authors of last week’s Mairzy Doats, later teamed up with Mack David to form a trio specializing in nonsense songs: theirs are the famours Bibbidi Bobbidi Boo from Walt Disney’s Cinderella (1950) as well as The Unbirthday Party from Disney’s Alice in Wonderland (1951). Before these songs, the first two in a series of eight to receive an Academy-Award nomination, however, they wrote Chi-Baba, Chi-Baba (My Bambino Go to Sleep), no. 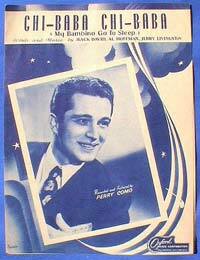 1 in the charts for three weeks in 1947 thanks to Perry Cuomo‘s performance. can’t you see your doll is sleepy, too? This entry was posted in Nonsense Lyrics, Podcasts. Bookmark the permalink.